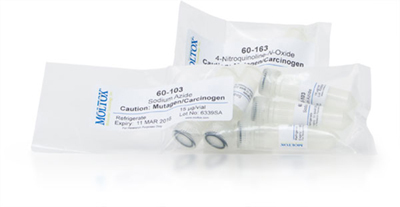 CONTROLCHEM™ are chemical mutagens and promutagens for conduction of positive quality controls. Packaged quantities are precise within 1%. Please note: CONTROLCHEM™ chemicals (CC) are known mutagens/carcinogens/toxins. They are only sold to those experienced in the safe handling and disposal of hazardous materials. Consult your Institutional Safety Expert before ordering. The above list is representative of products we have on stock. We welcome the opportunity to provide you with custom formulations. Please ask for a quote, our labs provide a lower cost, on time solution!